McCormick & Company (MKC), Incorporated engages in the manufacture, marketing, and distribution of spices, seasoning mixes, condiments, and other flavorful products to retail outlets, food manufacturers, and foodservice businesses. It operates in two segments, Consumer and Industrial. 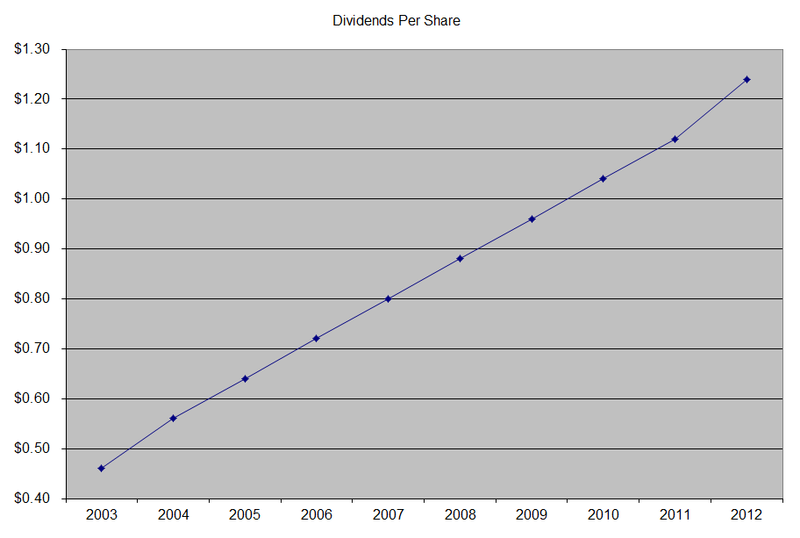 This dividend champion has paid dividends since 1925 and has increased them for 28 years in a row. The company’s latest dividend increase was announced in November 2013 when the Board of Directors approved an 8.80% increase in the quarterly annual dividend to 37 cents /share. Over the past decade this dividend growth stock has delivered an annualized total return of 11.60% to its shareholders. 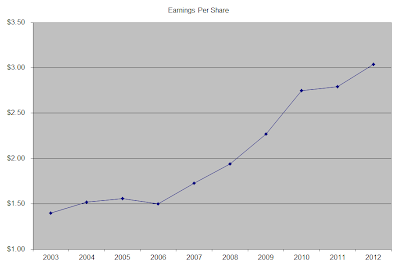 The company has managed to deliver a 9.20% average increase in annual EPS over the past decade. McCormick is expected to earn $3.13 per share in 2013 and $3.45 per share in 2014. 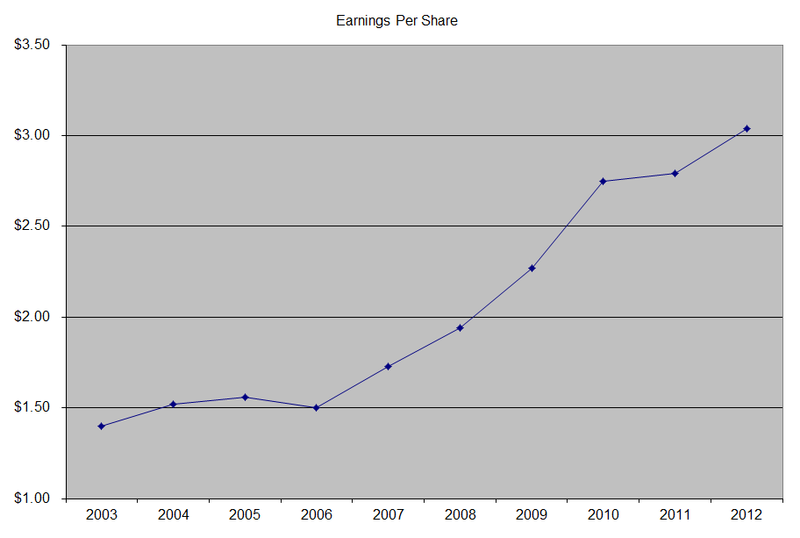 In comparison, the company earned $3.04/share in 2012. In addition, between 2003 and 2013, the number of shares decreased very slightly from 142 million to 134 million. Given the fact that shares are frequently overvalued, I would not want management to be repurchasing stock at rich prices. This wide-moat company is the leader in global spices and seasonings with over one fifth of the market, which ensures advantages of scale. It is four times larger than its next competitor. Besides scale, the company also has strong brand names such as McCormick and Lowry, which face limited pricing threats. Almost 60% of revenues are from the US, with 20% from Europe, Middle East and Africa and the remainder from the rest of the world. Revenues are derived from two segments, Consumer with 60% and Industrial with 40%. The Consumer segment offers spices, herbs, seasonings, and dessert items directly, as well as through distributors or wholesalers to various retail outlets, including grocery stores, mass merchandise stores, warehouse clubs, and discount and drug stores, as well as supplies private label items. The Industrial segment provides seasoning blends, natural spices and herbs, wet flavors, coating systems, and compound flavors directly, as well as through distributors to food manufacturers and foodservice customers. The largest customers are Wal-Mart Stores (WMT) and PepsiCo (PEP) with 11% of McCormick’s sales each. Other major customers include McDonald’s, Sysco, General Mills, Kraft Foods, Yum! Brands etc. Most of the company’s revenues are derived from its branded spices. Private label spices account for a low amount of revenues, but can solidify relationships with retailers, and provide a foot in the door for the company. Future growth in earnings per share can be generated through organic growth, acquisitions, innovation, and cost saving initiatives. McCormick invests in its brands and has pricing power in them and also has the scale to be the lowest cost producer in its market. While spices are expensive, their cost relative to the price of a meal. The goal of the company is to grow sales by 4%- 6%/year in the long run. The company also wants to increase earnings per share by 9 – 11%/year. The company has been active in the acquisitions front, in order to generate sales and expand its product and geographical reach. For example it purchased Chinese company Wuhan in 2013, Polish company Kamis in 2011, and started a joint venture with Indian company Kohinoor Ltd. The company is targeting faster growing regions with these acquisitions, and it is also trying to capitalize on difference in tastes in different countries. McCormick also invests in innovation, in an effort to bring new products to the marketplace. In its 2014 product pipeline includes grill mates steak sauce, Zatarain’s microwaveable rice in the US. 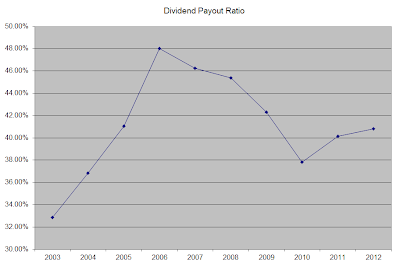 The annual dividend payment has increased by 11.40% per year over the past decade, which is higher than the growth in EPS. 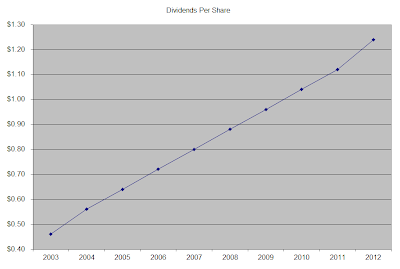 An 11% growth in distributions translates into the dividend payment doubling every six and a half years on average. Future dividend growth would have to track growth in earnings per share, and would likely be in the 9%-11% range annually. 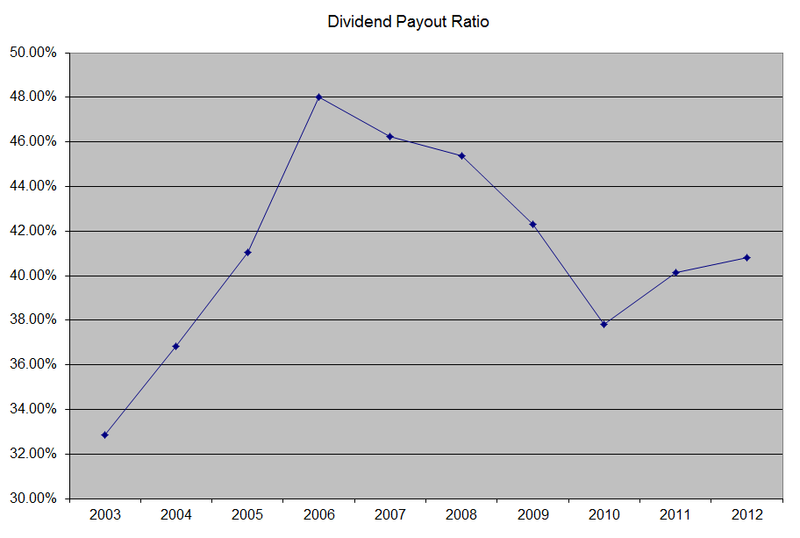 The dividend payout ratio increased from 33% in 2003 to almost 48% in 2006, before decreasing to 41% in 2012. A lower payout is always a plus, since it leaves room for consistent dividend growth minimizing the impact of short-term fluctuations in earnings. 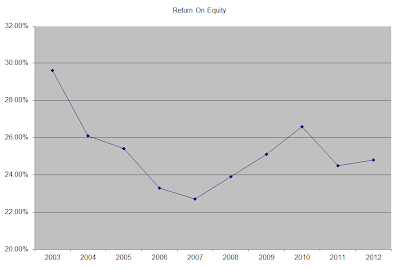 The company has a high return on equity, which has decreased slightly over the past decade. This indicator seems to have bottomed out and is on the rebound as of recently. Rather than focus on absolute values for this indicator, I generally want to see at least a stable return on equity over time. 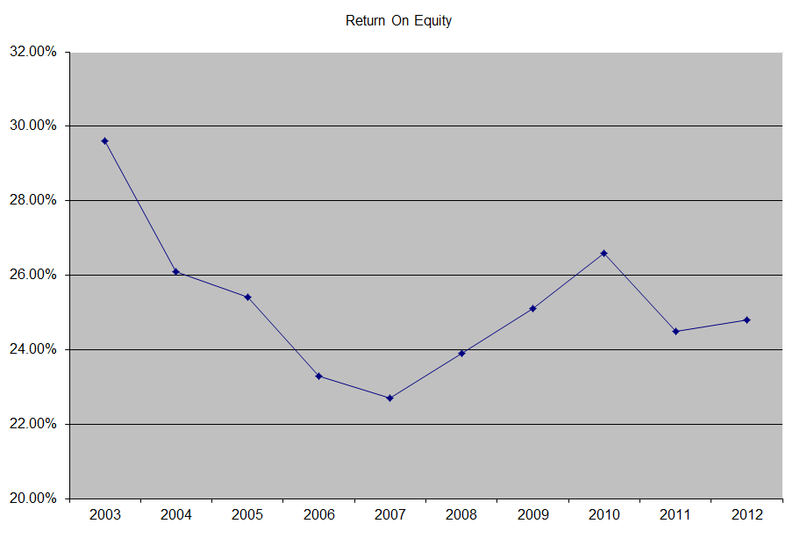 Currently, the stock is slightly overvalued, as it trades at a P/E of 20.10 and yields only 2.30%. I am analyzing the company because I believe it is quality dividend growth stock, which will be a very good investment on dips below $63, which is equivalent to a P/E of 20 and a current yield above 2.50%. If the stock price remain around $69/share however throughout 2014, rising earnings per share would eventually result in a P/E of 20 simply by waiting. A wonderful business like McCormick will compound earnings and dividends for its investors over time, which is why it is frequently overvalued. I always want to have some margin of safety in case things do not turn out as expected, as I try to avoid getting overly excited about any individual security. I initiated a half position in McCormick & Co, after the market dropped on Monday. While entry yield is lower than my criteria of 2.50%, I bought this compounding machine because I believe it will be able to grow and provide sustainable dividend growth in the future. I have also found it helpful to monitor quality companies I am interested in much better, when I have skin in the game. If the stock price keeps sliding down, I will keep adding.